When Chancellor Angela Merkel declared in May 2011 that Germany would seek to phase out all its 17 nuclear reactors by 2022, questions arose as to whether wind and solar power together with other renewable sources could grow quickly enough to feed the Country with clean energy. Six years after that statement, nine nuclear reactors have been switched off and renewables have more than picked up the slack, making Germany a leader in the energy revolution amongst large industrial nations. 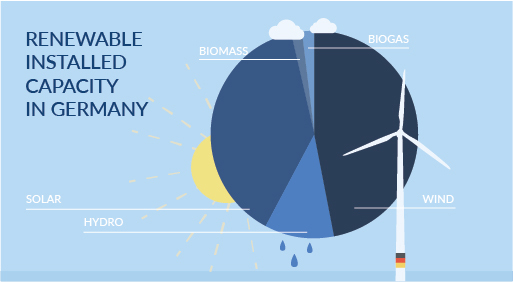 Today, with over 105 GW of renewable installed capacity, Germany is the largest energy market in Europe. Wind power, which accounts for 49 GW of the total portfolio, has become the most important source of electricity production, followed by solar power, which grew sharply over the last nine years, from 4 GW in 2007 to 41 at the of 2016. 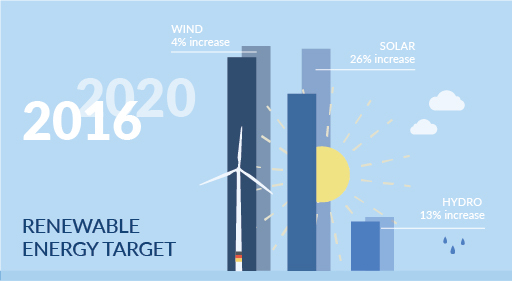 These achievements are the results of country’s fundamental changes experienced over the last decades, largely driven by the Energiewende, the renewable act cornerstone of energy policy’s turnaround. With a continuous commitment to meet industry wide requirements while shifting towards an environmental-friendly energy system, Germany aims to have banned combustion engines by 2030 and plans to have its carbon emissions at just 20% of 1990’s level. Meantime, in the first half of 2017 a new record-breaking has been achieved by the green nation generating 35% of power from renewables from 33% the previous year, according to the Renewable Energy Federal Association, known as the BBE. Scholars of the association were impressed to discover that 87% of last year’s electrical capacity growth was due to renewable energy and that the country produced 141,908 GWh of sustainable clean electricity in 2015. In this epochal transformation for Germany, BaxEnergy has always been playing a pioneering role in its industry evolution, being truly founded in the heart of Country’s wind energy district and reaching a monitored power of almost 1GW among solar and wind sources. From more than ten years, we are closely working with large utilities, independent power producers, O&M across the different Länders, offering high quality solutions that combine best-in-class technologies with long-lasting experience and expertise from a talented team of visionaries. By aiming to contribute to Germany’s independence from fossil fuels, BaxEnergy has also recently moved its headquarters in the vibrant location of the EUREF Technology Campus in Berlin, continuing to serve the evolving market’s demands and spreading innovation directly from the Europe’s very epicenter. Moved by its dynamic attitude and always eager for new challenges, BaxEnergy will not miss the opportunity to shape the future of the renewable growth joining and exhibiting at HUSUM Wind 2017, the most important trade fair for the German wind industry. Our team of experts is looking forward to welcoming you at booth 5A06 hall 5, for a personal talk and demo about the portfolio of solutions we offer to you to increase your power plants’ lifetime and your overall investments.